If you've been waiting to get your hands on Android 7.0, Nougat, today's the day. 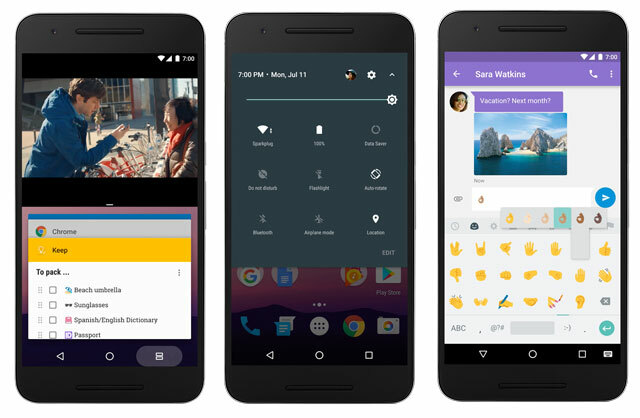 Google is currently rolling out Nougat to Nexus devices, including the Nexus 6, Nexus 5X, Nexus 6P, Nexus 9, Nexus Player General Mobile 4G (Android One) and Pixel C devices. Even if you have one of these phones, you probably won't get Nougat immediately, as Google is rolling out the update in stages. Expect an over the air update—you should get a notification on your device when it's available—in the coming weeks. If your smartphone isn't on this list, that doesn't mean it won't be getting an update—simply that the manufacturer hasn't yet confirmed it. If you have a fairly recently released smartphone, it's likely to be updated to Nougat. LG's V20 will be the first smartphone to ship with Nougat pre-installed and we expect Nexus devices will ship with Nougat pre-installed soon. Updated emoji, including 72 all new emoji. Better looking games with the new Vulkan graphics API. A new Virtual Reality mode that lets you use some apps in a VR environment via Daydream. Though the phones, headsets and controllers that support it won't be available until later this year, the software is rolling out now. A new multitasking mode that lets you run multiple apps side by side. It's a great addition for tablets, but you can use it on phones, too, sizing the app windows until each is just right. Direct Reply, which lets you easily respond to notifications without leaving the app you're in. Quick Switch, which lets you jump between your recently used apps by tapping the Overview button twice. A Quick Settings menu to easily access Bluetooth, Wi-Fi, and other key features—like the flashlight. And, of course, the battery. While an Android update can't make your smartphone's battery bigger, it can improve how your phone uses that battery. Nougat features an updated Doze mode. Originally added to Android in Marshmallow, Doze puts your phone into an energy saving mode when it's not being used—which meant sitting still with the screen off. Nougat improves this by letting your phone Doze even if it's being jostled around in your pocket or purse, which should make the battery savings more significant. You'll still get high priority updates, but for the most part your phone, as the name implies, is taking a nap. Nexus owners can look forward to getting the Nougat update soon while other Android owners, depending on their phone's manufacturer, can expect it in the coming months.